The most versatile color choices are the first to push white, and this year's not to be missed is ~ ~ milk tea color! Material. Material ___________________________ • Brass, white jade, turquoise, brass grid. 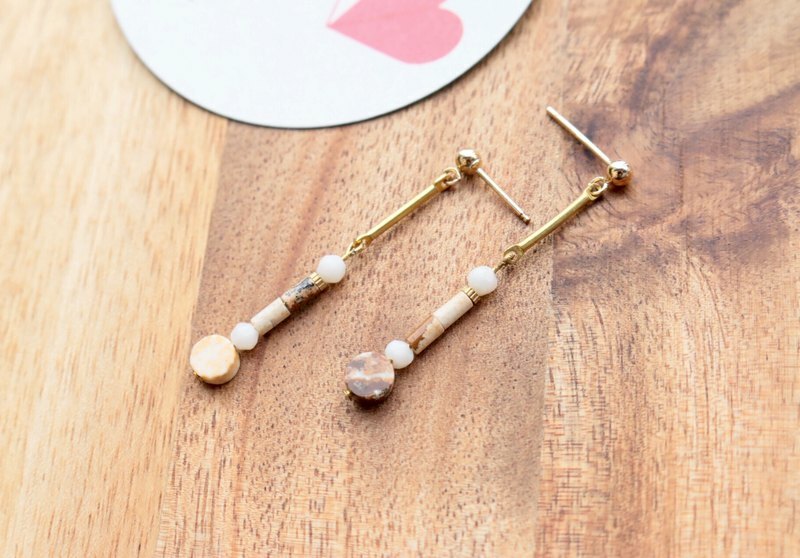 • Ear pins: 14k gold • Size: total length is about 3.9cm 成品 Due to the different shapes and sizes of the materials, the length of the finished product may vary from 0.1 to 0.4 cm. Product packaging ___________________ 棉If you spend more than 1,000 yuan, you will be given a cotton bag. The packaging style will be changed from time to time. Please refer to the new product page for the style. https://c1.staticflickr.com/1/479/31523541635_e46043d0f7_b.jpg Shipping time. Shipping information ___________________________ Ordered orders are sent out in about 3 to 5 working days. For urgent orders, please contact the designer first. The goods are hand-made after you place the order, and no return will be provided after the sale. Precautions. Use and maintenance _________________________________________ https://c2.staticflickr.com/6/5604/31446793846_c535a0fc04_b.jpg ☞ Natural stone is different in the way of mining veins and cutting materials. The color of each natural stone product is dark, texture, crystal, shape, size, thickness, etc. There may be differences, there may be cracks, impurities, mines, etc. Wait a little, the actual finished product can't be exactly the same as the merchandise. ☞Electroplating metal contact water will oxidize and fade and cannot be recovered in an easy way. Please avoid touching or wearing a bath. ☞Integrated sterling silver and brass metal ornaments, pendants, etc. are all “matte” polished, non-mirror polished. 所有All items in the image may have color differences due to factors such as light or computer screen resolution.